در این مقاله فرایند ساخت قالب برای استوانه مشبک کامپوزیتی مطالعه گردیده و نمونه مشبک با استفاده از روش رشته پیچی ساخته شده است. همچنین رفتار سازه مشبک کامپوزیتی استوانه‌ای با الگوی مثلثی از جنس شیشه- اپوکسی تحت بار ضربه‌ای به صورت تجربی و عددی بررسی شده است.. به منظور آزمون ضربه از دستگاه تفنگ گازی استفاده شده است که سرعت ورودی و خروجی از دستگاه به دست می‌آید. همچنین برای این آزمون فیکسچر مناسبی طراحی شده است. پرتابه مورد استفاده به شکل استوانه و دارای سر کروی می‌باشد. شبیه سازی عددی آزمون ضربه انجام شده است و با نتایج تجربی صحت سنجی شده است. سرعت خروجی، سطح آسیب، جدایش بین پوسته و ریب به صورت تجربی و عددی با هم مقایسه شده‌اند. 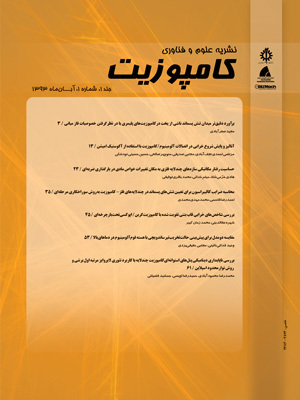 در نهایت به بررسی عددی اثر نوع پرتابه و زاویه لایه چینی بر روی پارامترهای ضربه پرداخته شده است. در محدوده زاویه لایه چینی 45 درجه کم‌ترین میزان سرعت خروجی پرتابه و بیش‌ترین میزان جذب انرژی را دارا می‌باشد. پرتابه سرتخت نسبت به دو پرتابه سرمخروطی و سر کروی به دلیل این‌که سر پرتابه سطح تماس بیش‌تری با پوسته دارد، بیش‌ترین آسیب را به سازه وارد می‌کند و در نتیجه سرعت خروجی پرتابه کم‌تر و جذب انرژی سازه بیش‌تر است. In this paper, the process of manufacture of template for lattice cylindrical composite is studied and lattice composite samples has been manufactured by the filament winding process. Also, the structural behavior of lattice cylindrical composite made by glass/Epoxy with triangular cells has been studied under high velocity impact by experimental and numerical analysis. A gas gun testing machine has been used for high velocity impact test that recorded the input and output velocities. Also, for this test, suitable fixture has been designed. The cylindrical projectile with spherical head has been used as impactor. Numerical simulation of impact tests has been conducted by ABAQUS commercial finite element code and the results have been verified by experimental results. Output velocity, surface damage, the separation between the shell and the rib are compared experimentally and numerically. Finally, numerical investigation of the shape of the projectile and the layup orientation has been done. Results show that 45 degrees angle of layup has minimum output velocity and maximum energy absorption. Also, the projectile with flat head has been created maximum area damage, because of the less area contact with shell relative to another projectiles, therefore has less output velocity and more energy absorption. Mingfa, R.Haoran, C. Qizhong, H.,“Resin Flow of an Advanced Grid-Stiffened Composite," Springer, Composite Material, vol. 20, pp. 303–314, 2012. Tsai, W. Lin, K., ” Manufactureing composite grids for shell of revolution,” Proc.4th Internation SAMPE symposium and exhibition, Long Beach, California, 1999. Kim, D., “Fabrication and testing on composite isogrid stiffened cylinder,” Composite Structures, Vol. 45, PP. 1-6, 1999. Gibson, R. E.Newaz, G. M.Gan, C., “Analytical/Experimental Investigation of Energy Absorption in Grid-Stiffened Composite Structures Under Transverse Loading,” Experimental Mechanics, Vol. 44, No. 2, pp 185-194, 2004. Jadhav, P.Mantena, P. R. Gibson, R. F., “Energy absorption and damage evaluation of grid stiffened composite panels under transverse loading,” Composites: Part B, Vol. 37, pp. 191–199, 2005. Fan, H. L. Yang, W. Chao, M., “Microwave absorbing composite lattice grids,” Composite Science and Technology, Vol. 67, pp. 3472-3479, 2007. Pernas-Sánchez, J.Artero-Guerrero, J. A.ZahrViñuela, J.Varas, D.López-Puente, J., “Numerical analysis of high velocity impacts on unidirectional laminates,”Composite. Structure, Vol. 107, pp. 629–634, Jan. 2014. Donadon, M. V.Iannucci,L.Falzon, B. G.Hodgkinson, J. M. Almeida, S. F. M.,“A progressive failure model for composite laminates subjected to low velocity impact damage,”Computers and Structures, Vol. 86, pp. 1235-1252, 2008. Wang,S. X. Wu, L. Z.,” Low-velocity impact and residual tensile strength analysis to carbon fiber composite laminates,” Materials and Design, Vol. 31, pp. 118-125, 2010. Hedayatian, M.Liaghat,G. H. Rahimi,G. H. Po, M. S. l.Khoshsorour, M.,“Experimental study on dynamicresponse of grid cylindrical compositestructures under high velocity impact,”Journal. Modares Mechanical. Engineerimg, Vol. 14, No. 2, pp. 41-46. (In Persian). Gibson, R. F. R.,“Principles of composite material mechanics,”CRC press, 2012. Gershon, B.Marom, G.,“Fracture toughness and mechanical properties of glass fibre-epoxy composites,” Material Science, Vol. 10, pp. 1549-1556, 1975.